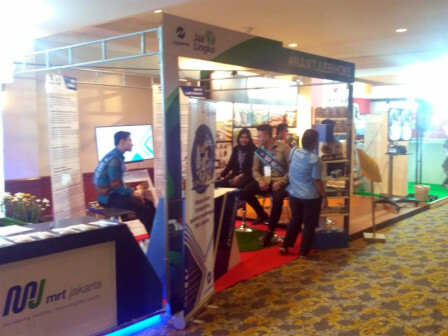 As many as 16 booths owned by BUMD and SKPD are enlivening the work meeting of Indonesian Provincial Government Association (APPSI) at Borobudur Hotel, Central Jakarta.
" Residents who want to know the superior service products here, visit our booth"
There is variety of superior products and services seen on display at the event held on December 5-6. Jakarta Governance Bureau Head, Premi Lasari explained that among the booths are exhibiting Betawi Houses, Jakarta Smart City, Jakarta Investment Center, LED, and PTSP. There is also a food program from Pasar Jaya Perumda, PT. Tjipinang Djaya Food Station and PD Dharma Jaya, as well as transportation model from PT. Trans Jakarta, PT. MRT Jakarta, zero down-payment housing program, PD Pembangunan Sarana Jaya, and PT Jakarta Propertindo housing. "We also show visitors about IKM serving under DPE, UKM under KUKMP Dept., Dekranasda, cheap food, KPKP Dept., and Bank DKI," he expressed, Thursday (12/6). He explained that the exhibition booth began to open from 10 AM-10 PM. "Residents who want to know the superior service products here, visit our booth," he concluded.